CARMEL, Calif. —Carmel business owners are picking up the pieces after a fire ripped through the New Masters art gallery Saturday evening. 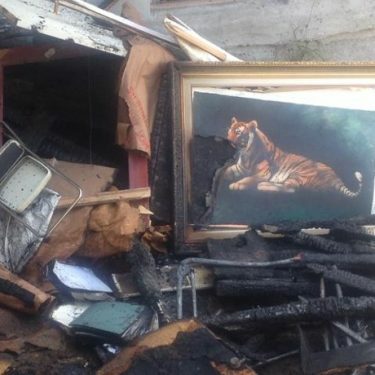 Firefighters were able to save most of the artwork inside. The fire broke out in the back of the New Masters gallery, leaving behind burnt parts of the building and singed pieces of art. Structural damage is estimated at more than $200,000, not including the cost to replace destroyed artwork. Art vendors next door dealt with severe smoke damage. Despite the losses, business owners are staying positive. Firefighters said the incident could have been much worse. A team effort from agencies around the Central Coast saved the building. Heavy char and a trail of smoke line the side of the building where the fire ripped through gallery but the good news, according to the fire department, is that most of the paintings, worth millions of dollars, were saved. “In this instance, we were able to save a very beautiful building and we were able to provide very good service,” Sands said. While the fire department sticks around to investigate the cause of the fire, business owners will continue to pick up the pieces and move forward.